First appeared on medium. Create a custom blockchain & ICO. The recent boom of financial technologies related to the use of blockchain has increased in the past years. Blockchain technology is poised to affect a myraid of industries including the financial, real estate, social media, healthcare, and cyber security. However, there are very few projects working on streamlining the deployment of blockchains, apps, and p2p tech. Most blockchain projects are still young. When utilizing them, and particularly before investing in them, do your research: read the project website, social media posts, ask questions on their public forums, and understand what they are trying to accompish. Just like with any new industry, there are hoax projects and scammers, but the diamonds of the industry are revolutionizing the world. For those who are looking to challenge the status quo, blockchain technology represents a powerful force, just waiting for you to exploit it. In our opinion some of those projects include Bitcoin, Komodo, Ethereum, Iota, Nem, and Qtum. It’s our goal to become the facilitators between enterprise and open-source communities in the blockchain sector. We realize there is a lack of adoption of certain projects with high capacity blockchains such as NEM and Komodo Platform. Both of which allow companies to launch blockchains in a few minutes with minimal friction. It is hard to pinpoint the reason for the slow growth in comparison to other platforms but we believe the first step is to remove the entry barrier for projects looking to launch their own blockchains and decentralized applications. Our research indicates that there is a growing gap between both industries and we are here to bridge it. ChainZilla offers a range of services that include public & private blockchains, atomic swap-based apps, and custom wallets. Our services are built on Komodo, Nem, Qtum, and Ethereum. We have chosen the most robust and decentralized ecosystems to provide our clients with blockchain solutions that will be relevant for years to come. However, the ultimate goal is to pierce the traditional ICO markets and offer blockchain solutions that cater to traditional enterprise. Additionally, we plan to focus our efforts to bring Fintech to undeveloped regions such as South America. 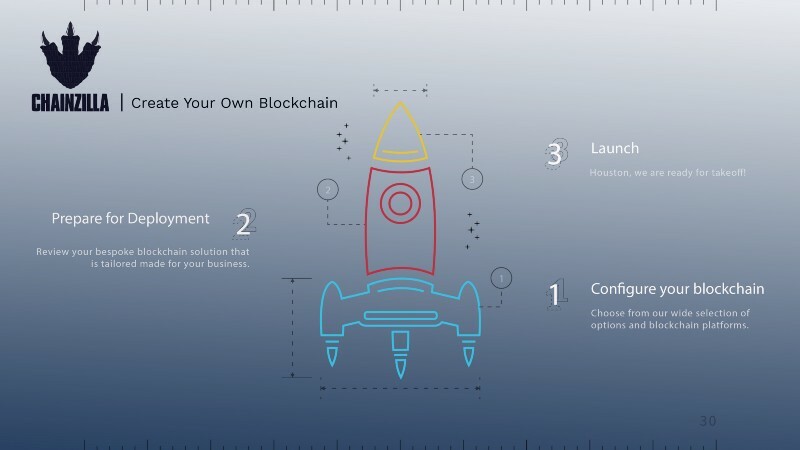 ChainZilla has streamlined the process of blockchain creation, ICO management, and p2p app development. The delivery time for a DIY blockchain package that includes a minimum viable blockchain, a wallet, an explorer, a paperwallet, and a dico app is 4 weeks. If you have any inquiries regarding blockchain creation and development don’t hesistate in contacting a ChainZilla representative at contact@chainzilla.io. For special partnerships reach out to partners@chainzilla.io.